I started working on Lauren again, because someone on Ravelry started a little KAL for this pattern. Mine had almost gone into hibernation, and I was feeling a little bit guilty about that. I got the kit as a birthday present, and it is such lovely yarn to work with. And I still like the design very much. So I was really happy with this KAL. My left front piece was done in one evening, and then I started on that awful ribbing again (1×1 ribbing on 2,25 mm needles) for the right front. I worked on it last weekend, and this weekend again for hours and hours and now IT IS DONE. No one who hasn’t knit Lauren can understand what an achievement this is! 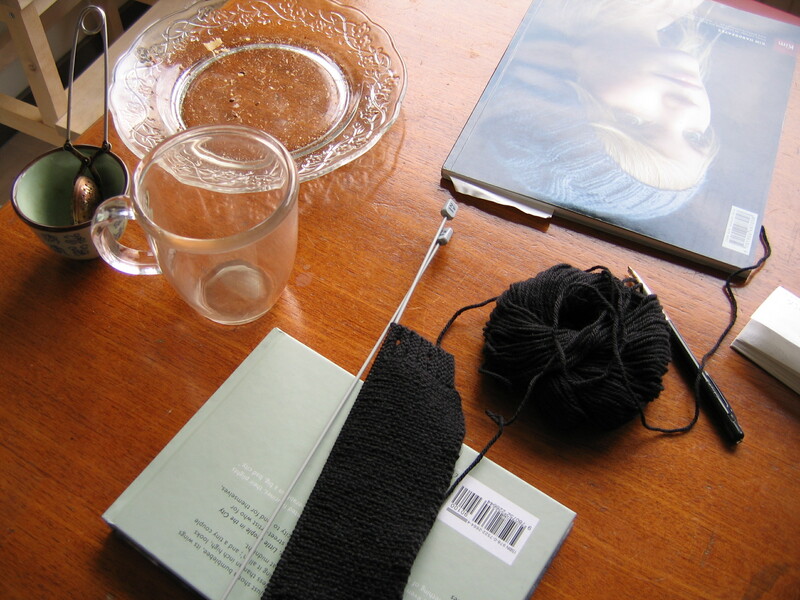 I am now working with the 3 mm needles again, and that is just easy relaxed knitting. This means I am now sure Lauren will get finished some day. I have done all the big parts of ribbing now. Of course there is ribbing on the sleeves, and Kim definitely likes long cuffs, but I think they are doable. I think it will be a very nice cardigan to wear in spring. I will try to have it finished by then.